A new programme for 2014 River Tyne trips has been announced. These include Pirate Days for the kids, fish 'n' chips specials and sing-a-longs. Take a look at the link. "How do you fancy a boat trip up the River Tyne?" That was my husband's question as he 'phoned me on his way to work – "It's on Friday 13th," was his next statement. He had been reading a free newspaper on his commute to work. I'd mentioned something a few months ago, wondering if they still did trips along the River Tyne? Something must have clicked when he saw the ad. 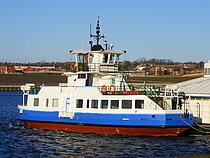 We live at the mouth of the River Tyne and a regular ferry service for foot passengers and cyclists runs from North Shields to our home town of South Shields every half hour during the day, but in recent years the ferry company, operated by Nexus (who are also responsible for the Metro system around Tyneside), have offered trips along the river going upstream to Newcastle as a kind of pleasure cruise, with food and entertainment onboard. The 'Pride of the Tyne' was set to leave at 7.30pm prompt so we arrived about half an hour earlier and stepped aboard. 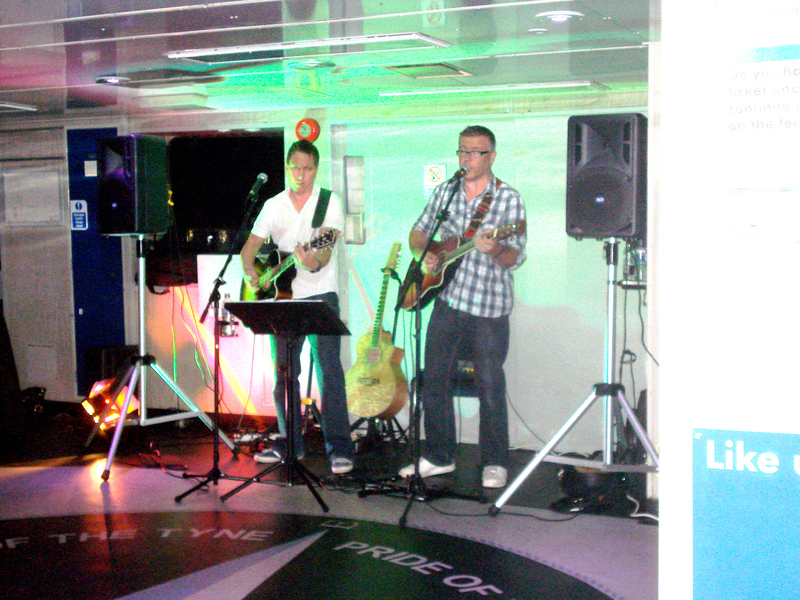 It seemed quite surreal to see the old 'workhorse' of a ferry set out with tables and tablecloths and a band playing merrily in one corner. From the outside deck we had a good view of the riverside development, which was literally brand new, some of the structure wasn't open to the public and the gardens had just been planted. 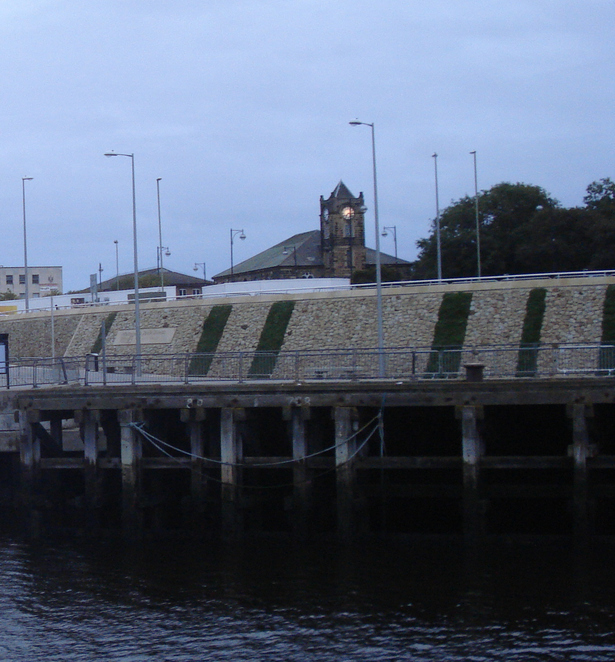 For many years the Tyne was an industrial river and the area beside the ferry landing had been a coal staiths until relatively recently, with coal from the local mines being brought by rail directly in order to be loaded onto colliers – literally 'Taking coals from Newcastle', as the saying went. Now there is no trace of the industry that once stood there, in fact there is a wonderful view of our Saxon heritage in the form of St Hilda's church in South Shields market place and many local people had campaigned not to have a built up riverside once the old industrial structures disappeared, despite it being a prime piece of land in the town centre. Across the river you can see the cruise/ferry terminal at Royal Quays from where the rather larger car ferry sails on the high-tide each evening. Cruise ships have also docked there, many of the passengers American, coming to see our historical sites, including the 'Harry Potter' castle at Alnwick in Northumberland, whilst, nestled in a little bend of the river just a couple of hundred metres from the ferry landing, is the Customs House theatre and arts venue at the Mill Dam. It was twilight when we left the ferry landing and headed up-river. In truth there's not too much to see on the way up the Tyne. The last time I did such a trip was when I was in primary school in the 1960s, when a school trip was organised for our year group. Back then there were docks, shipyards and heavy industry all the way along the river banks and I can still remember the horrendous smell as we sailed under the Tyne Bridge where industrial waste and untreated sewage bilged out directly into the waters of the Tyne. Nowadays waste is dealt with in a more eco-friendly way and the river is frequently dredged. There have been reports of salmon returning to the river to spawn in the shallower waters upstream and the journey is very pleasant now. As we chugged along, 'The Buskers' provided the entertainment for the evening, playing everything from Dire Straits 'Sultans of Swing' to traditional Irish music such as 'The Wild Rover' and 'Whiskey in the Jar'. I love to hear live music, especially when the band can really 'play'. 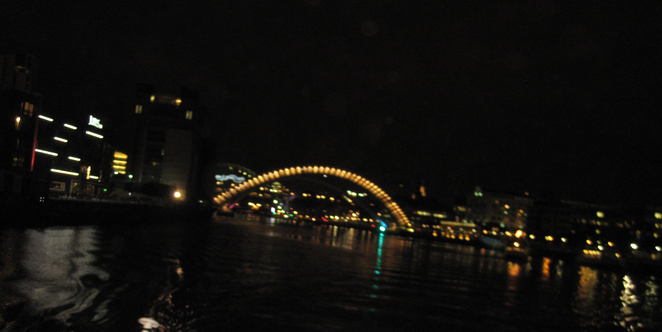 The real treat, however, was the city lights of Newcastle, with the Millennium Bridge and Tyne Bridge illuminated and the 'Great North Run' logo emblazoned across the Tyne Bridge for the first time. 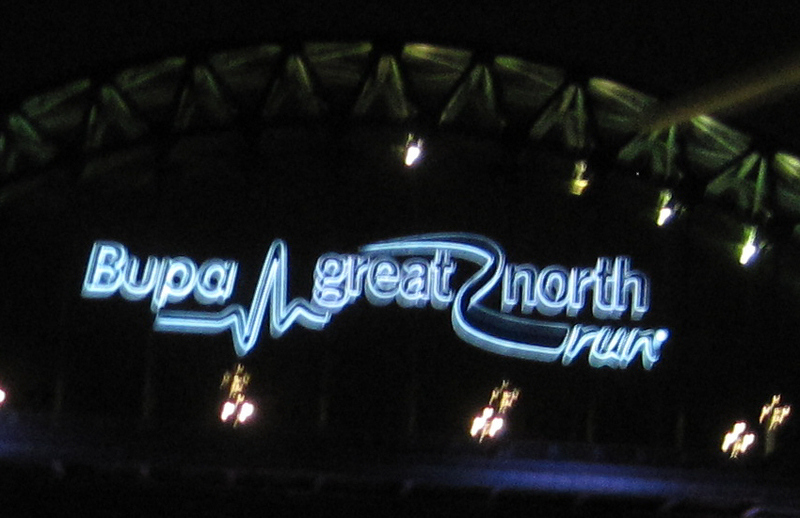 With only two days until the big day, Bupa, the GNR sponsors were really pushing the boat out. Some of the other lights along the Newcastle/Gateshead Quayside included the Sage building, the Baltic Centre for Contemporary Art and Jury's Inn, while the Millennium Bridge glowed red and blue and was opened especially for the ferry to sail under it. The whole scene provided beautiful reflections in the water. Once again Newcastle proved what a beautiful, forward thinking city it has become. A million miles away from it's 'cloth cap' image of bygone years. Too soon, it was time to head back and we got our pie and pea supper on the return journey. The food could have been hotter and it might have helped if we'd had some commentary because the best view just 'snuck up' on us. The boat has an upper open top deck and an interior deck with disabled toilet. The bar and food service was on the lower deck, not usually open to the public and there were toilets available on these other decks too. This trip took place on Friday 13th September 2013 and there is another planned for Friday 27th September. Perhaps the reason for this is that it needs to be dark enough to appreciate the lights of Newcastle and, now that the long hours of daylight are fast disappearing and we approach the autumn nights, there's only a few opportunities to do this kind of trip. Throughout the summer there has been a programme of afternoon themed river trips to suit all ages, including fish and chip trips with a sing-a-long session and some specially for children such as an animal themed excursion and a Captain Jack pirate adventure. Children can dress up or just come as they are and a range of activities is available depending on the theme. There are no more dates available for afternoon river trips in the 2013 Summer Programme but a new programme for 2014 will be announced in the New Year. The Quayside Night Lights Cruise has one more date on Friday 27th September 2013. Tickets Cost £15 and children must be aged over fifteen and accompanied by an adult. The trip lasts around 3 hours.